Oriental Economics: Chinese Slowdown, Japanese Déjà vu? China’s real estate prices continue to rise notwithstanding the government curbs on the property markets during the past few years. 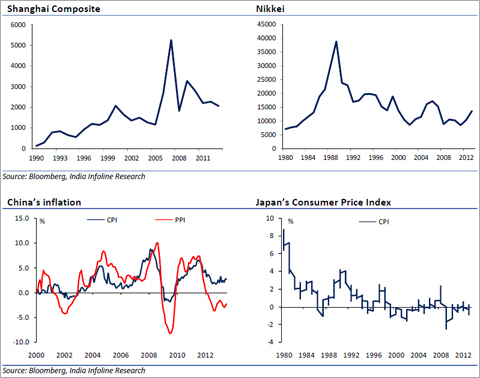 China appears to be on the same path of what has transpired in Japan during the past two decades. Even as critics argue on the same, there is some degree of resemblance between the prevalent Chinese economy and the situation in Japanese economy during 1980s and 1990s. To begin with, Chinese affluent class is shoring up asset classes (categorically real estate) and in the process stimulating prices. China’s real estate prices continue to rise notwithstanding the government curbs on the property markets during the past few years. 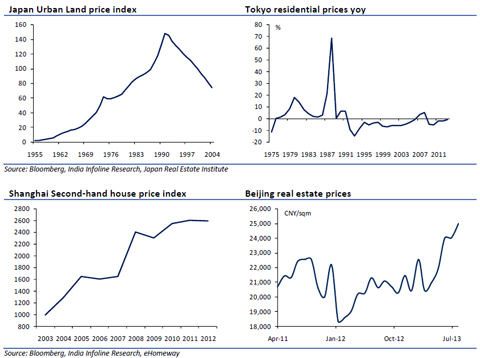 Housing sector in China is reminiscent of the asset price bubble in Japan during 1980s, which can precede economic stagnation and long term deflation. During the past decade, China has predominantly occupied the headlines as it is deemed to be the engine of global economic growth. However, during the past few years, we have witnessed a drastic transition in the country’s growth trajectory. China is expected to grow at a moderate 7% rate, as compared with double digit growth rate (11-14%) during 2000-2010. Japan has already gone through the shift in the economic pattern, whereby growth of 10-12% during 1960s halved to 4-5% during 1970s-1980s and has eventually hit the nadir of 0-2% during 2000s. Although China has moved ahead of Japan as far as growth and the size of the economy are concerned, escalating quantum of the country’s bank credit remains a worry. China’s bank credit to GDP ratio has reached a situation, which is akin to the bubble peak in Japan during 1980s and 1990s. Similar to Japan, Chinese banking system is troubled with high ratio of non-performing loans. Rapid credit expansion which fuelled exceptional economic growth during the yesteryears is now deemed as a culprit for the bubbles in the economy. Expanding credit supply can be colloquially termed as an ‘amphetamine’, which has cranked up phenomenal asset appreciation during the past few years. However, over-dosage of the stimulant can lead to chronic depression. During the last two decades, China’s growth story is primarily driven by government spending and investment on fixed assets. However, contribution of household spending to the country’s GDP has been waning, which is not a healthy sign in the long run. It is interesting to compare China with Japan, as far as the imbalance between household spending and government investment is concerned. The imbalance is asymmetrical, whereby household consumption in Japan constitutes major chunk (60%) of the GDP, while China cannot boast the same. Healthy economies dedicate substantial quantum of their GDP to private consumption. For instance, consumer spending contributes 70% to US GDP. China, however seems to be leveraging absolutely on government spending and investments. It is noteworthy to study why the private consumption is so low in China. The clear answer is that China always had a large population and surplus labor. Excess labor helped China invest profusely in manufacturing capacities, roads and infrastructure. Excess labour also implies cheap wages, which was easily accessed from the vast rural parts of the country. So even when the economy witnessed drastic growth, the wages were always kept low. Thus, low wages effectuated low share of household consumption to GDP, as the middle class never got their actual share in the country’s astronomical economic growth. In fact, the economic benefits have been channelized to the vested interests, categorically politicians and state-owned enterprises. Restrained wages, expanding credit and suppressed currency have been the conduit of transferring wealth from households to business units. Therefore, the dichotomy always prevailed, whereby investments spiraled and domestic consumption languished. However, it is widely reported that China is now close to the proverbial “Lewis turning point”. The turning point is based on the economic model which refers to the dual aspect of development. At the initial stage, there is excess supply of labour primarily from the subsistence sector (agriculture) which enables the capitalists (industrial sector) to generate higher profits, aided by low wages. Higher profits lead to savings which is reinvested in capital accumulation. Capital formation finances expansion and in the process requires more labor from the subsistence sector. However, the economy reaches a point, where the excess labour from agriculture and rural areas is fully absorbed into industries and further expansion leads to rise in wages. This is the turning point. On the same lines, China has grown rapidly for the last three decades due to the cheap labour from its vast rural population, which has been agrarian by occupation. However, wide scale urbanization has outpaced the growth in labour supply, effectively exerting upward pressure on the wages. Needless to mention, stringent one child policy has significantly changed the demographic fabric of the country, which in fact has also mitigated the excess labour. As a result, the country has witnessed wage increases during the past few years. This is a game changer for the economic activity, whereby growth is highly sensitive to hike in wages. In simpler terms, the economic growth starts slowing as cheap labour becomes a constraint. Gazing at historical numbers, one can easily infer that contribution of household spending to China’s GDP has literally halved from 63% in 1970 to 34% in 2011. In fact, the fall has been intense during the past decade as well, where the share of consumption stood at 45% in 2000. This transformation seems to be unparalleled, as it has never been witnessed in any of the emerging economies. Other emerging economies like BRIC countries or MIKT nations (Mexico, Indonesia, South-Korea & Turkey) have maintained much higher levels of household consumption than China. Among the BRIC nations, China is the only one to have a consumption share of GDP drop below 40%. According to the World Bank, household consumption share of the GDP for Brazil, Russia and India during 2011 was 60%, 50% and 60% respectively. The need of the hour for China is to realign the structure of the economy, whereby more weightage has to be allotted to consumption. Experts claim that China is trying to rejig its economy and attain normal growth pattern; however, the shift to higher household consumption will be a long gestation process. Considering the current GDP growth rate of 6-7% per annum, China will require more than a decade to bring the household consumption levels reach the point, where countries like India Brazil, Russia and Japan stand today. Although China’s statesmen are determined to boost the growth in household consumption, there is lot of cynicism regarding the resolve and the initiatives taken by the government. Structural changes in the economic growth model are a prerequisite and there is absence of political will for taking the much needed measures. For instance, wages in China are rising, which implies that the labourers have begun to reap the benefits of economic progress. At the same time, the capitalist class will witness lower returns on their investments due to higher labour costs. This can dissuade future investments and effectively dampen the nation’s growth trajectory. The billion dollar question is whether China is ready to face slower growth for quite some time and simultaneously and gradually pass the economic benefits to the lower and middle economic strata of the society. If truth be told, the regime may proclaim about the transition but is yet not ready to bite the bullet. This can be manifested by the fact that China is simply stimulating the economy by depreciating the Yuan (making exports competitive) and inundating various industries with cheap financing. Over the past few years, there has been significant expansion in credit supply. However, this expansion has failed to effectuate recovery in the broader economy, which can be manifested by the fact that China’s GDP growth has slowed down during the past two quarters. In the meantime, total domestic Chinese debt levels are also soaring. Excessive lending has been funneled into larger government-controlled industrial units, effectively leading to excess production capacity. Larger state-owned companies are successful in availing the chunk of bank finance, while the small and medium enterprises are deprived of credit. During June this year, China’s central bank initiated some measures in order to restrict the expanding credit supply, however, failed to persist with it. Chinese credit markets witnessed turbulence, as the monetary authorities deliberately averted injecting additional liquidity into the money markets. Overnight interest rates spiked to as high as 30% and forward rates rose also surged during the third week of June, as speculation was rife that the Bank of China ducked out on an interbank payment. The central bank reverted on this by assuring that no banks were in default and would keep money supply at reasonable levels. In fact, People's Bank of China injected 50bn Yuan (US$8.17bn) into the financial system in order to ease the cash squeeze. Consequentially, interest rates came off their June highs, with the seven day repo rate moving back to the normal 4%, down from 11.5%. 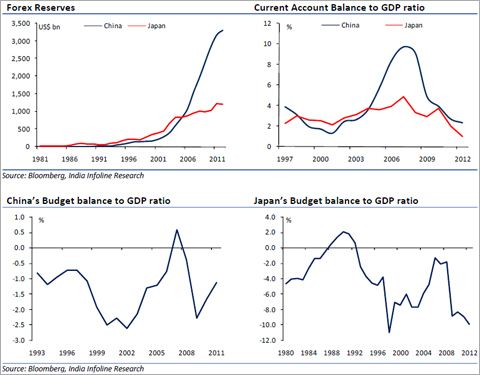 China and Japan both have positive current account balance and substantial foreign exchange reserves, which allow them the privilege of persisting with lax financial and monetary policies. As a result, spiralling property prices in China is a by-product of sustained monetary stimulus and has encouraged speculation in various asset classes as well. Like Japan, China has a weak banking framework, which weighs on the overall health of the economic system. China suffers from highs levels of non-performing loans but the same is not reflected in the figures released by the government authorities. The prevalent financial environment incentivises excess lending and credit appraisal is not paid too much heed. 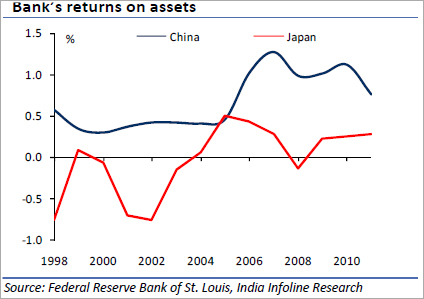 Banks in China and Japan are enduring weak returns on assets, which clearly epitomises the fact there has been inappropriate deployment of capital. Chinese government has been primarily focussed on achieving faster GDP growth whereby the rationale for equitable and sustainable growth has withered on the vine. Rampant urbanisation and industrialisation has created excess capacities in various commodity markets and overheating in property markets. In fact, China’s prior Premier Wen Jiabao had echoed the same during March 2013, claiming that the economy faces mounting social problems and unsustainable growth. The situation calls for rebalancing the economic structure, which implies the growth to moderate from double digit rate during the previous decade to just 7% per annum during the next few years. It also implies a transition from investment-oriented economy to consumption-oriented. 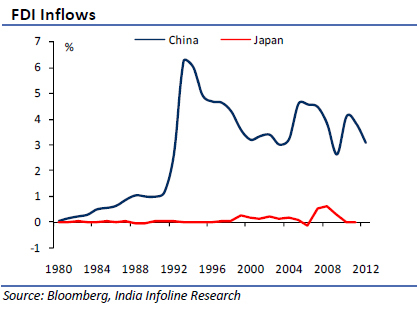 Foreign direct investment inflows in the dragon country have moderated substantially during the past few years. This exhibits waning investor confidence in the world’s manufacturing hub. However, foreign investments have also slowed down in various emerging economies and can be attributed to the gloomy economic landscape across the globe. Will China be the next Japan? China is hoping that its situation does not exacerbate akin to Japan, whereby the land of the rising sun witnessed an economic boom during the second half of the 19th century but stagnated as it approached the new millennium. The economy bore the brunt of collapsing real estate prices during 1990s, which has not recovered till date. In addition, high ratio of non-performing loans and struggling equity markets aggravated the slowdown. China is already paying a price for overheating, with the economy now witnessing a drastic slowdown. Concerns of profound stagnation loom large and one cannot discard this possibility. Although China’s prevalent woes are similar to Japan’s situation during 1990s, the world’s fastest growing economy is unlikely to contract. We infer that China’s economic growth will cool down further but may not enter into a recessionary era. This can be explained by the fact that despite several problems, China remains a decent growth story in the medium-to long-term. We rule out an economic crash, as China’s on-going urbanisation and presumed shift from investment to consumption is likely to mitigate the slowdown during this decade. Nevertheless, this may not be a smooth journey and involve considerable fiscal pain. The cliché “Chickens come home to roost” may hold true for China, as its economy has to pay some price for the overheating done during the last decade.